Wellesley Bank has been serving Wellesley, Mass., and the greater Boston area since 1911, providing individuals, families and businesses with exceptional service and trusted financial advice. 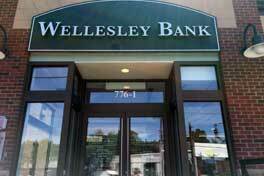 Now, Wellesley has opened a new location to serve its valued customers even more conveniently. Located in the heart of Newton Centre, the new branch offers the same trusted services and benefits that Wellesley has come to be known (and prized) for—perks such as free access to any of its ATMs anywhere across the globe, and Wellesley’s unheard-of insurance on any deposit, no matter how small or large. Not only do you get world-class convenience, you also get the peace of mind that comes from dealing with a financial partner that cares just as much as you do about keeping your hard-earned money safe. Stop in today, call 617-778-5888 or visit wellesleybank.com to learn more.